First humans appear in Salmineria; Egyptians. Romans appear; Purgatorius established. Official Salmineria calendar established. 1193 Murgorath born on Earth, in England, at Stonehenge. Wizard’s Guild established – headquarters at Izmiris. Murgorath elected as the first Center. The threat of the demons cause the elves join the war. With the help of Murgorath the elves build Minas Palanar (Tower of Warning) and Minas Nimgul (the Tower of White Magic), and several weapons of great power. Esafs established, each a supreme ruler of a massive multi-ethnic army. Murgorath also given immortality spell. Construction begins. Esafs demand that “Strictures” be added to the Crystal. Wizard-Esaf pact signed. Nexus establishes friendships with Elves and with Rauders. Nexus elected Center. Nexus marries Rauder woman. Takair born. Desna born (the first elf born in a thousand years.) Large celebrations. End of the Golden Years. “Wizards War” begins. Murgorath comes out of retirement, petitions Elves for aide. The fall of Aloria; the concealment of Desna. War intensifies. Rumors spread of evil Elvin ghost warriors that are nearly unstoppable. Rauder tribes refuse to enter the war, refuse to fight the Elf-zombies. Murgorath overthrown, killed. Rauders are not welcomed in Condeu, and border disputes immediately become an issue. 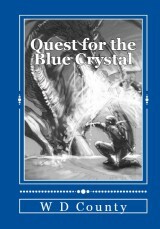 Desna departs on quest to reach the Crystal and free the Elves; he may be the Taka Shema. He does not return. 6947 Kratia elected to Circle of Lords. One of the most skilled wizards ever known. 6949 2007 Billy and Drake arrive in Salmineria.